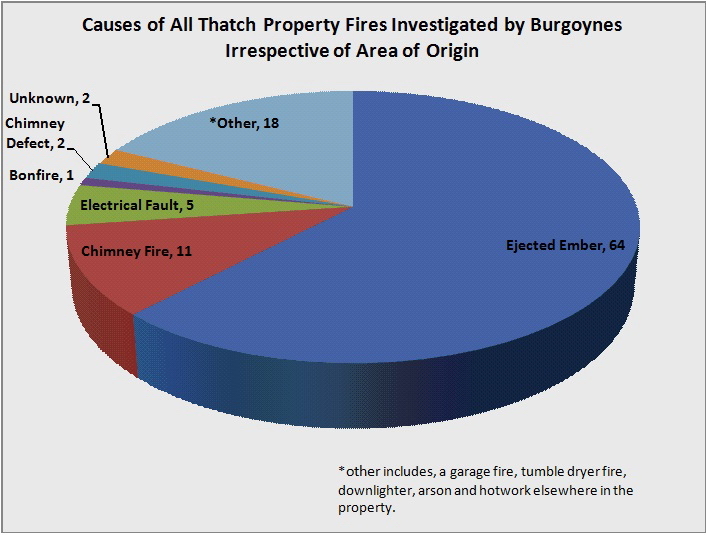 A report from fire investigators Burgoynes into the cause of thatch fires revealed ejected embers and sparks as one of the main causes. Investigations have shown that many thatch fires relate to the use of wood burning stoves and have occurred within 30 minutes of the stove being lit. In addition, some home-owners were found to be using unsuitable materials to get the wood burner/fire started in the first place. Spark Arrestors – If not cleaned at least once a year then soot deposits can build up and ignite causing a fire in their own right, which in turn could cause a thatch fire. A number of fire services recommend the removal of spark arrestors although a wire-mesh bird guard could be installed to deter birds from nesting but still allow the chimney to function efficiently. Chimney Height – The risk of a thatch fire is further increased when the chimney height has been reduced following many years of re-coating works, this is more common with thatching materials such as long straw. The main purpose of a fire retardant is to starve the ignition area of oxygen and therefore delay the spread of flame and the full development of a thatch fire. The idea is to buy more time so that the fire and rescue service have a greater chance of extinguishing the fire before it fully develops. 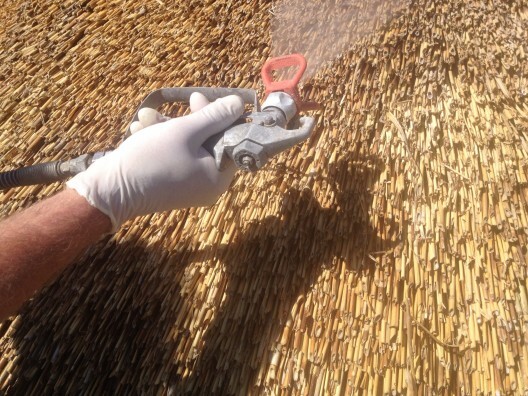 Thatchsayf Spray System is a water based solution containing fire retardant and intumescent ingredients for the protection of thatched roofing. This environmentally friendly solution is applied externally to the thatch surface and penetrates the stems of the thatch by up to 75mm, forming a thin protective film on the surface of the thatch stems. A treated roof will offer protection from a number of fire risks, including sparks, ejected embers, bonfires, Chinese lanterns, fireworks and barbecues. On exposure to these risks, Thatchsayf Spray System will ‘foam up’ (intumesce) and form a carbonised char, which binds the thatch stems together, cutting off the supply of oxygen to the fire, delaying the spread of flame and lowering the radiated heat output. The application of Thatchsayf Spray System is undertaken by our fully trained employees using specialist spraying equipment and is normally carried out between March and the end of October. This is due to the high levels of moisture in the air during the winter months. Once a roof is treated, the homeowner is issued with a Certificate of Completion, which is valid for five years after which re-application is required. A new build/newly thatched roof offers a good opportunity to treat a roof. However, an existing thatched roof can also be treated as long as it is in good condition. Thatchsayf Spray System can be applied as a standalone product or in addition to having a physical fire barrier system installed. We suggest you contact your insurance company to check if any discounts are available for taking a proactive approach by treating the roof with a fire retardant spray and fire barriers.